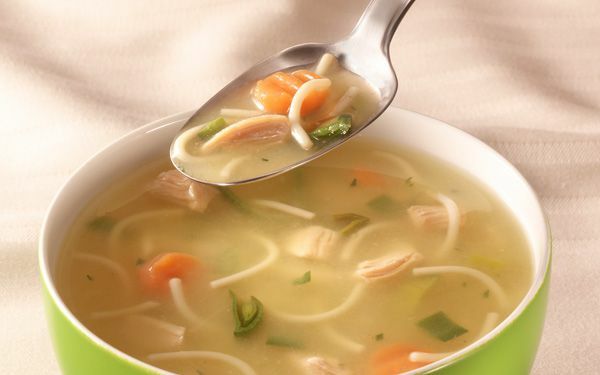 You asked us, does chicken soup really help with a cold? And we went to Generic Grandma for this one. Yes, it actually looks like her chicken soup might make you feel better. Like over-the-counter cold meds, chicken soup isn't going to cure your cold. Or even make it shorter. But it can probably reduce your symptoms. And make you that much less miserable. 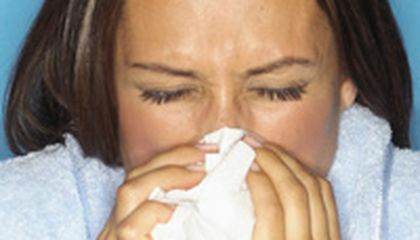 The virus that's invaded your body and made you sick isn't to blame for your stuffy nose, your cough, and other nastiness. You can actually thank your body for that. And lucky us, one of the side effects of this defense structure is serious uptick in mucus. Anyway, research suggests that chicken soup has a little something. Something -- and don't ask me what -- because we don't actually know yet. That something slows down mucus production. It gets existing muck to run out. At the very least, chicken soup helps keep you hydrated. And it fills your belly with nutritious, yummy veggies and other good stuff. So the next time you're sick, reach for a big bowl of brothy goodness. It just might make you feel better. For more stories like this, check us out every day at Smithsonian.com. No sciencey soup for you. No soup. No science. This article is about how chicken soup can help with your cold. It wont help make your cold or sickness go away but it does help wit the symptoms. It slows down the building up mucus and pushes the excising muck out. It helps keep you hydrated and gives you good nutritious value and other good things for your body. Chicken soup can help you feel better when you are sick. And it can help you stuffy nose.